Highlander Marine Services Ltd (HMS) is committed to providing specialized marine support services in a professional, consistent manner. Our trailerable, high-speed, aluminum catamaran landing crafts and highly trained crew are available 24 hours a day, 365 days a year to help get your job done. 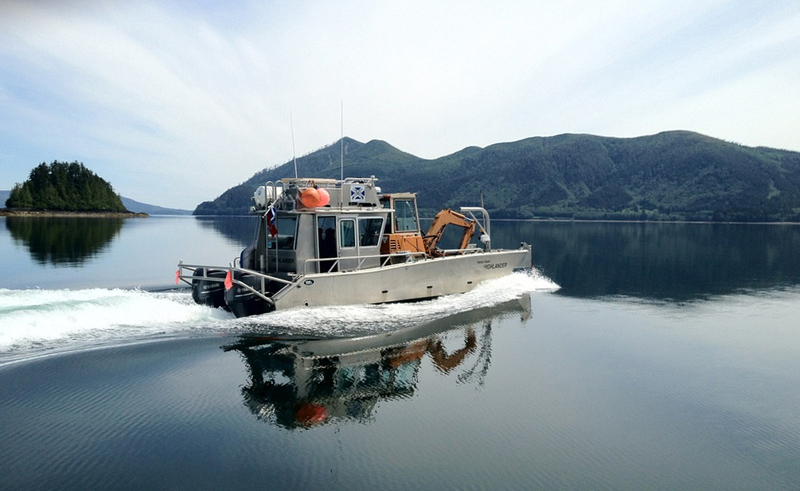 Our landing crafts are transport Canada certified passenger carrying vessels. They are capable of achieving high speeds with full loads and are custom built to handle marine conditions and weather commonly found on the north coast of BC and Haida Gwaii. We are able to provide fast, efficient and economical support service for all types of marine jobs. Click here to see our vessel specifications. Read more or view our Terms and Conditions here. Highlander Marine Services has affiliated with Fraser Burrard Diving Limited to provide commercial dive services to industry in Haida Gwaii. 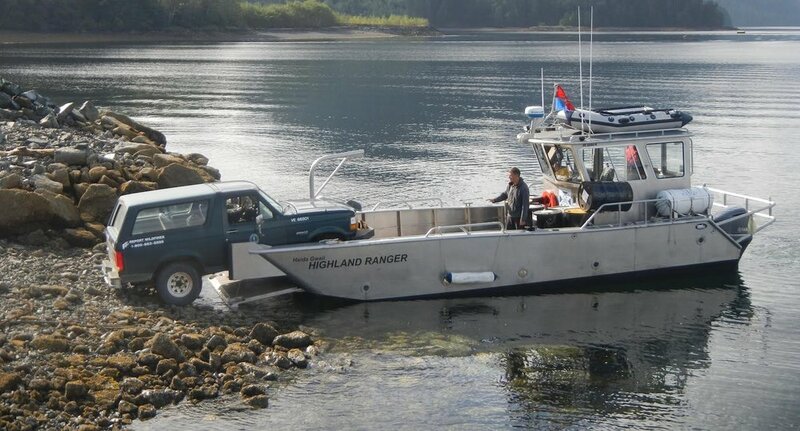 With a set of commercial dive gear on island and HMS's high speed landing crafts we can offer a safe, certified, quick response at a reasonable rate, anywhere on Haida Gwaii. Watch a short promotional clip of Highlander Marine Services on the job. Read an article about Highlander Marine Services in Western Mariner Magazine. Follow a surfing expedition that Highlander Marine Services supported in SBC Surf Magazine. Highlander Marine Services can support whatever your initiative may be but does not offer guided tours or guided fishing trips. If you're looking for this kind of experience we recommend local companies such as Haida Style Expeditions and Moresby Explorers. Left image: Denny Sinnott of the Canadian Hydrographic Service taking Highlander Marine wear to a whole new level in San Fransisco. Tricorp (Tribal Resource Coorporation) and Aboriginal Business Canada. © 2016 Highlander Marine Services Ltd.